Thunderbolt is the brand name of a hardware interface developed by Intel (in collaboration with Apple) that allows the connection of external peripherals to a computer. Thunderbolt 1 and 2 use the same connector as Mini DisplayPort (MDP), whereas Thunderbolt 3 re-uses the Type-C connector from USB. It was initially developed and marketed under the name Light Peak, and first sold as part of a consumer product on 24 February 2011. Via DisplayPort protocol or USB-based external audio cards. Supports audio through HDMI converters. This is the pinout for both sides of the connector, source side and sink side. The cable is actually a crossover cable, it swaps all receive and transmit lanes; e.g. HS1TX(P) of the source is connected to HS1RX(P) of the sink. Thunderbolt combines PCI Express (PCIe) and DisplayPort (DP) into two serial signals,  and additionally provides DC power, all in one cable. Up to six peripherals may be supported by one connector through various topologies. Intel will provide two types of Thunderbolt controllers, a 2-port type and a 1-port type. Both peripherals and computers need to include a controller. Thunderbolt controllers multiplex one or more individual data lanes from connected PCIe and DisplayPort devices for transmission via two duplex Thunderbolt lanes, then de-multiplex them for use by PCIe and DisplayPort devices on the other end. 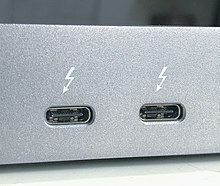 A single Thunderbolt port supports up to six Thunderbolt devices via hubs or daisy chains; as many of these as the host has DP sources may be Thunderbolt monitors. A single Mini DisplayPort monitor or other device of any kind may be connected directly or at the very end of the chain. Thunderbolt is interoperable with DP-1.1a compatible devices. When connected to a DP-compatible device, the Thunderbolt port can provide a native DisplayPort signal with four lanes of output data at no more than 5.4 Gbit/s per Thunderbolt lane. When connected to a Thunderbolt device, the per-lane data rate becomes 10 Gbit/s and the four Thunderbolt lanes are configured as two duplex lanes, each 10 Gbit/s comprising one lane of input and one lane of output. 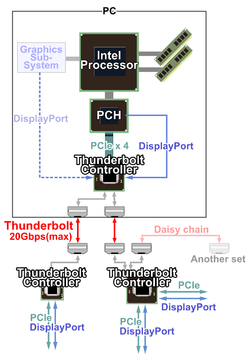 Thunderbolt can be implemented on PCIe graphics cards, which have access to DisplayPort data and PCIe connectivity, or on the motherboard of new computers with onboard video, such as the MacBook Air. The interface was originally intended to run exclusively on an optical physical layer using components and flexible optical fiber cabling developed by Intel partners and at Intel's Silicon Photonics lab. It was initially marketed under the name Light Peak, and after 2011 as Silicon Photonics Link. However, it was discovered that conventional copper wiring could furnish the desired 10 Gbit/s per channel at lower cost. This copper-based version of the Light Peak concept was co-developed by Apple and Intel. Apple registered Thunderbolt as a trademark, but later transferred the mark to Intel, which held overriding intellectual-property rights. Thunderbolt was commercially introduced on Apple's 2011 MacBook Pro, using the same Apple-developed connector as Mini DisplayPort, which is electrically identical to DisplayPort, but uses a smaller, non-locking connector. Sumitomo Electric Industries started selling up to 30-metre-long (100-foot) optical Thunderbolt cables in Japan in January, 2013, and Corning, Inc., began selling up to 60-metre-long (200-foot) optical cables in the U.S. in late September, 2013. Intel introduced Light Peak at the 2009 Intel Developer Forum (IDF), using a prototype Mac Pro logic board to run two 1080p video streams plus LAN and storage devices over a single 30-meter optical cable with modified USB ends. The system was driven by a prototype PCI Express card, with two optical buses powering four ports. Jason Ziller, head of Intel's Optical I/O Program Office showed the internal components of the technology under a microscope and the sending of data through an oscilloscope. The technology was described as having an initial speed of 10 Gbit/s over plastic optical cables, and promising a final speed of 100 Gbit/s. At the show, Intel said Light Peak-equipped systems would begin to appear in 2010, and posted to YouTube a video showing Light Peak-connected HD cameras, laptops, docking stations, and HD monitors. On 4 May 2010, in Brussels, Intel demonstrated a laptop with a Light Peak connector, indicating that the technology had shrunk enough to fit inside such a device, and had the laptop send two simultaneous HD video streams down the connection, indicating that at least some fraction of the software/firmware stacks and protocols were functional. At the same demonstration, Intel officials said they expected hardware manufacturing to begin around the end of 2010. In September 2010, some early commercial prototypes from manufacturers were demonstrated at Intel Developer Forum 2010. Though Thunderbolt was originally conceived as an optical technology, Intel switched to electrical connections to reduce costs and to supply up to 10 watts of power to connected devices. In 2009, Intel officials said the company was "working on bundling the optical fiber with copper wire so Light Peak can be used to power devices plugged into the PC". In 2010, Intel said the original intent was "to have one single connector technology" that would allow "electrical USB 3.0 ... and piggyback on USB 3.0 or 4.0 DC power". Light Peak aimed to make great strides in consumer-ready optical technology, by then having achieved "[connectors rated] for 7,000 insertions, which matches or exceeds other PC connections ... cables [that were tied] in multiple knots to make sure it didn't break and the loss is acceptable" and "you can almost get two people pulling on it at once and it won't break the fibre". They predicted that "Light Peak cables will be no more expensive than HDMI". In January 2011, Intel's David Perlmutter told Computerworld that initial Thunderbolt implementations would be based on copper wires. "The copper came out very good, surprisingly better than what we thought", he said. A major advantage of copper is the ability to carry power. The final Thunderbolt standard specifies 10 W DC on every port. See comparison section below. Intel and industry partners are still developing optical Thunderbolt hardware and cables. The optical fiber cables are to run "tens of meters" but will not supply power, at least not initially. The version from Corning contains four 80/125 µm VSDN[definition needed] fibers to transport an infrared signal up to 190 metres (600 feet). The conversion of electrical signal to optical will be embedded into the cable itself, allowing the current MDP connector to be forward compatible, but eventually Intel hopes for a purely optical transceiver assembly embedded in the PC. The first such optical Thunderbolt cable was introduced by Sumitomo Electric Industries in January 2013. It is available in lengths of 10 metres (30 feet), 20 metres (70 feet), and 30 metres (100 feet). However, those cables are retailed almost exclusively in Japan, and the price is 20 to 30 times higher than copper Thunderbolt cables. German company DeLock also released optical Thunderbolt cables in lengths of 10 metres (30 feet), 20 metres (70 feet), and 30 metres (100 feet) in 2013, priced similarly to the Sumitomo ones, and retailed only in Germany. In September 2013, US glass company Corning Inc. released the first range of optical Thunderbolt cables available in the Western marketplace outside Japan, along with optical USB 3.0 cables, both under the brand name "Optical Cables". Half the diameter of and 80% lighter than comparable copper Thunderbolt cables, they work with the 10 Gbit/s Thunderbolt protocol and the 20 Gbit/s Thunderbolt 2 protocol, and thus are able to work with all self-powered Thunderbolt devices (unlike copper cables, optical cables cannot provide power). The cables extend the current 30 metres (100 feet) maximum length offered by copper to a new maximum of 60 metres (200 feet), allowing peripheral Thunderbolt devices to be attached farther away from their host device(s). As of January 2019[update] there are no optical Thunderbolt 3 cables available. However, optical Thunderbolt 1 and 2 cables can be used with Apple's Thunderbolt 3 (USB-C) to Thunderbolt 2 adapter's on each end of the cable, in order to achieve connections up to the 60 metres (200 feet) maximum offered by the previous generations of the standard. CNET's Brooke Crothers said it was rumored that the early-2011 MacBook Pro update would include some sort of new data port, and he speculated it would be Light Peak (Thunderbolt). At the time, there were no details on the physical implementation, and mock-ups appeared showing a system similar to the earlier Intel demos using a combined USB/Light Peak port. Shortly before the release of the new machines, the USB Implementers Forum (USB-IF) announced they would not allow such a combination port, and that USB was not open to modification in that way. Other implementations of the technology began in 2012, with desktop boards offering the interconnection now available. Apple stated in February 2011 that the port was based on Mini DisplayPort, not USB. As the system was described, Intel's solution to the display connection problem became clear: Thunderbolt controllers multiplex data from existing DP systems with data from the PCIe port into a single cable. Older displays, using DP 1.1a or earlier, have to be located at the end of a Thunderbolt device chain, but native displays can be placed anywhere along the line. Thunderbolt devices can go anywhere on the chain. In that respect, Thunderbolt shares a relationship with the older ACCESS.bus system, which used the display connector to support a low-speed bus. In February 2011, Apple introduced its new line of MacBook Pro notebook computers and announced that the technology's commercial name would be Thunderbolt, with MacBook Pros being the first machines to feature the new I/O technology. In May 2011, Apple announced a new line of iMacs that include the Thunderbolt interface. The Thunderbolt port on the new Macs is in the same location relative to other ports and maintains the same physical dimensions and pinout as the prior MDP connector. The main visible difference on Thunderbolt-equipped Macs is a Thunderbolt symbol next to the port. The DisplayPort standard is partially compatible with Thunderbolt, as the two share Apple's physically compatible MDP connector. The Target Display mode on iMacs requires a Thunderbolt cable to accept a video-in signal from another Thunderbolt-capable computer. A DP monitor must be the last (or only) device in a chain of Thunderbolt devices. In July 2011 Sony released its Vaio Z21 line of notebook computers that had a "Power Media Dock", using the optical iteration of Thunderbolt (Light Peak) to connect to an external graphics card using a combination port that behaves like USB electrically, but that also includes the optical interconnect required for Thunderbolt. In June 2013, Intel announced that the next generation of Thunderbolt, based on the controller code-named "Falcon Ridge" (running at 20 Gbit/s), is officially named "Thunderbolt 2" and entered production in 2013. The data-rate of 20 Gbit/s is made possible by joining the two existing 10 Gbit/s-channels, which does not change the maximum bandwidth, but makes using it more flexible. Thunderbolt 2 was announced by Apple in June 2013 on their developer-conference WWDC to be shipped in the next generation of Mac Pro. Thunderbolt 2 is shipping in the 2013 MacBook Pro, released on 22 October 2013. At the physical level, the bandwidth of Thunderbolt 1 and Thunderbolt 2 are identical, and Thunderbolt 1 cabling is thus compatible with Thunderbolt 2 interfaces. At the logical level, Thunderbolt 2 enables channel aggregation, whereby the two previously separate 10 Gbit/s channels can be combined into a single logical 20 Gbit/s channel. Intel says Thunderbolt 2 will be able to transfer a 4K video while simultaneously displaying it on a discrete monitor. Thunderbolt 2 incorporates DisplayPort 1.2 support, which allows for video streaming to a single 4K video monitor or dual QHD monitors. Thunderbolt 2 is backwards compatible, which means that all Thunderbolt cables and connectors are compatible with Thunderbolt 1. The first Thunderbolt 2 product for the consumer market was Asus's Z87-Deluxe/Quad motherboard, announced on 19 August 2013, but the first full product released with Thunderbolt 2 was Apple's late 2013 Retina MacBook Pro, on 22 October 2013. Thunderbolt 3 is a hardware interface developed by Intel and shares Type-C connectors with USB, and can require special "active" cables for maximum performance for cable lengths over 0.5 meters (1.5 feet). Compared to Thunderbolt 2, Intel's Thunderbolt 3 controller (codenamed Alpine Ridge, or the new Titan Ridge) doubles the bandwidth to 40 Gbit/s (5 GB/s), halves power consumption, and simultaneously drives two external 4K displays at 60 Hz (or a single external 4K display at 120 Hz, or a 5K display at 60 Hz when using Apple's implementation for the late-2016 MacBook Pros) instead of just the single display previous controllers can drive. The new controller supports PCIe 3.0 and other protocols, including DisplayPort 1.2 (allowing for 4K resolutions at 60 Hz). Thunderbolt 3 has limited power delivery capabilities on copper cables and no power delivery capability on optical cables. Using USB-C on copper cables, it can incorporate USB Power Delivery, allowing the ports to source or sink up to 100 watts of power. This eliminates the need for a separate power supply from some devices. Thunderbolt 3 allows backwards compatibility with the first two versions by the use of adapters or transitional cables. Low Power (LP) uses a PCIe 3.0 ×2 link to provide one Thunderbolt 3 port (JHL6240). This follows previous practice, where higher-end devices such as the second-generation Mac Pro, iMac, Retina MacBook Pro, and Mac Mini use two-port controllers; while lower-end, lower-power devices such as the MacBook Air use the one-port version. Support was added to Intel's Skylake architecture chipsets, shipping during late 2015 into early 2016. Devices with Thunderbolt 3 ports began shipping at the beginning of December 2015, including notebooks running Microsoft Windows (from Acer, Asus, Clevo, HP, Dell, Dell Alienware, Lenovo, MSI, Razer, and Sony), as well as motherboards (from Gigabyte Technology), and a 0.5 m Thunderbolt 3 passive USB-C cable (from Lintes Technology). In October 2016, Apple announced the updated MacBook Pro which features two or four Thunderbolt 3 ports, depending on the model. In June 2017, Apple announced new iMac models that feature two Thunderbolt 3 ports, as well as the iMac Pro, which would feature four ports when released in December 2017. On 8 January 2018, Intel announced a product refresh (codenamed Titan Ridge) which enhanced robustness and added support for DisplayPort 1.4. The new peripheral controller is now capable of acting as a USB sink (compatible with regular USB-C ports). Intel offers a single port (JHL7340) and double port (JHL7540) version of this host controller and a peripheral controller supporting two Thunderbolt 3 ports (JHL7440). On 24 May 2017, Intel announced that Thunderbolt 3 would become a royalty-free standard to OEMs and chip manufacturers in 2018, as part of an effort to boost the adoption of the protocol. The Thunderbolt 3 specification was later released to the USB-IF on 4 March 2019, making it royalty-free. As of February 2019[update], there are no AMD chipsets or computers with Thunderbolt support released or announced. However, the YouTuber Wendell Wilson from Level1 Techs were able to get Thunderbolt 3 support on an AMD computer with a Threadripper CPU working by modifying the firmware, indicating that the lack of Thunderbolt support on non-Intel systems is not due to any hardware limitations. Apple released its first Thunderbolt-equipped computer in early 2011 with the MacBook Pro. The first Thunderbolt peripheral devices appeared in retail stores only in late 2011, with the relatively expensive Pegasus R4 (4-drive) and Pegasus R6 (6-drive) RAID enclosures by Promise Technology aimed at the prosumer and professional market, initially offering up to 12 TB of storage, later increased to 18 TB. Sales of these units were hurt by the 2011 floods in Thailand (who manufacture much of the world's supply of hard-drives) resulting in a cut to worldwide hard-drive production and a subsequent driving-up of storage costs, hence the retail price of these Promise units increased in response, contributing to a slower take-up of the devices. It also took some time for other storage manufacturers to release products: most were smaller devices aimed at the professional market, and focused on speed rather than high capacity. Many storage devices were under 1 TB in size, with some featuring SSDs for faster external-data access rather than standard hard-drives. Other companies have offered interface products, allowing multiple older, usually slower, connections to be routed through a single Thunderbolt port. In July 2011, Apple released its Apple Thunderbolt Display, whose gigabit Ethernet and other older connector types made it the first hub of its type. Later, companies such as Belkin, CalDigit, Other World Computing, Matrox, StarTech, and Elgato have all released Thunderbolt docks. As of late 2012, few other storage devices offering double-digit TB capacity had appeared. Exceptions included Sonnet Technologies' highly priced professional units, and Drobo's 4- and 5-drive enclosures, the latter featuring their own BeyondRAID proprietary data-handling system. Backwards compatibility with non-Thunderbolt-equipped computers was a problem, as most storage devices featured only two Thunderbolt ports, for daisy-chaining up to six devices from each one. In mid-2012, LaCie, Drobo, and other device makers started to swap out one of the two Thunderbolt ports for a USB 3.0 connection on some of their low-to-mid end products. Later models had the USB 3.0 added in addition to the two Thunderbolt ports, including those from LaCie on their 2big range. The late 2013 Retina MacBook Pro was the first product to have Thunderbolt 2 ports, following which manufacturers started to update their model offerings to those featuring the newer, faster, 20Gbit/s connection throughout 2014. Again, among the first was Promise Technology, who released updated Pegasus 2 versions of their R4 and R6 models along with an even larger R8 (8-drive) RAID unit, offering up to 32 TBs of storage. Later, other brands similarly introduced high capacity models with the newer connection type, including G-Technology (with their G-RAID Studio models offering up to 24 TB) and LaCie (with their 5big, and rack mounted 8big models, offering up to 48 TB). LaCie also offering updated designed versions of their 2big mainstream consumer models, up to 12 TB, using new 6 TB hard-drives. Thunderbolt 3 was introduced in late 2015, with several motherboard manufacturers and OEM laptop manufacturers including Thunderbolt 3 with their products. Gigabyte and MSI, large computer component manufacturers, enter the market for the first time with Thunderbolt 3 compatible components. Dell was the first to include Thunderbolt 3 ports in laptops with their XPS Series and their Dell Alienware range. Apple Mac machines with Thunderbolt 3 include: iMac Pro, iMac 2017, Mac Mini 2018, MacBook Pro 2016 onwards, MacBook Air 2018. Although Thunderbolt has initially had poor hardware support outside of Apple devices and has been relegated to a niche gadget port, the adoption of the Thunderbolt 3 using USB-C connector standard into a wide array of hardware bodes well for market acceptance of the standard. Thunderbolt — like many high-speed expansion buses, including PC Card, ExpressCard, FireWire, PCI, and PCI-X — is potentially vulnerable to a direct memory access (DMA) attack. If users extend the PCI Express bus (the most common high-speed expansion bus in systems as of 2018[update]) with Thunderbolt, it allows very low-level access to the computer. An attacker could physically attach a malicious device, which, through its direct and unimpeded access to system memory and other devices, would be able to bypass almost all security measures of the operating system, allowing the attacker to read and write system memory, potentially exposing encryption keys or installing malware. Such attacks have been demonstrated, modifying inexpensive commodity Thunderbolt hardware. An IOMMU, if present and correctly configured by the operating system, can close a computer's vulnerability to DMA attacks. This vulnerability is not present when Thunderbolt is used as a system interconnection (IPoTB supported on OS X Mavericks), because the IP implementation runs on the underlying Thunderbolt low-latency packet-switching fabric, and the PCI Express protocol is not present on the cable. That means that if IPoTB networking is used between a group of computers, there is no threat of such DMA attack between them. When a system with Thunderbolt boots, it will load and execute Option ROMs from attached devices. A malicious Option ROM can allow malware to execute before an operating system is started. It can then invade the kernel, log keystrokes, or steal encryption keys. The ease of connecting Thunderbolt devices to portable computers makes them ideal for evil-maid attacks. Some systems load Option ROMs during firmware updates, allowing the malware in a Thunderbolt device's Option ROM to potentially overwrite the SPI flash ROM containing the system's boot firmware. In February 2015, Apple issued a Security Update to Mac OS X to eliminate the vulnerability of loading Option ROMs during firmware updates, although the system is still vulnerable to Option ROM attacks during normal boots. Firmware-enforced boot security measures, such as UEFI Secure Boot (which specifies the enforcement of signatures or hash whitelists of Option ROMs) are designed to mitigate this kind of attack. In June 2011, the first two-meter Thunderbolt cable from Apple cost US$49. As an active cable, it contains circuitry in its connectors. 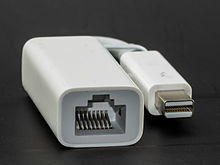 In June 2012, Apple began selling a Thunderbolt-to-gigabit Ethernet adaptor cable for US$29. In the third quarter of 2012, other manufacturers started providing cables of varying lengths up to the maximum supported length of three meters, while some storage-enclosure builders began including a Thunderbolt cable with their devices. In January 2013, Apple reduced the price of their 2-meter cable to US$39 and added a half-meter cable for US$29. Several other brands have released copper Thunderbolt cables, with some going up to the maximum 3 metres (10 feet) allowable for copper Thunderbolt cables. Initially, most devices did not come with an included Thunderbolt cable to keep selling cost lower, hence the mass usage of Apple's cables or third-party cables, especially if a user wanted 3m length, but most devices eventually began including some length of copper Thunderbolt cable with the product. With the introduction of Thunderbolt 3, Intel announced that otherwise-standard passive USB-C cables would be able to connect Thunderbolt devices at lower speeds than full active Thunderbolt cables, but still faster than USB 3.1. This allows for cheaper connections to new Thunderbolt devices, with inexpensive USB-C cables costing significantly less than active Thunderbolt cables. ^ a b "Apple Updates MacBook Pro with Next Generation Processors, Graphics & Thunderbolt I/O Technology" (Press release). Apple. 24 February 2011. Retrieved 17 August 2011. ^ a b c d e "Thunderbolt – Technology Brief". Intel. Retrieved 1 October 2012. ^ a b "Thunderbolt Device Driver Programming Guide". Apple. Retrieved 21 December 2011. ^ "Frequently Asked Questions (FAQs) - Thunderbolt Technology Community". thunderbolttechnology.net. ^ Frakes, Dan (24 February 2011). "What you need to know about Thunderbolt". MacWorld. Retrieved 17 April 2019. ^ Cunningham, Andrew. "USB 3.1 and Type-C: The only stuff at CES that everyone is going to use". ^ a b c Foresman, Chris (24 February 2011). "Thunderbolt smokes USB, FireWire with 10 Gb/s throughput". Ars Technica. Condé Nast Digital. Retrieved 24 February 2011. ^ a b c Dilger, Daniel Eran (24 February 2011). "Intel details Thunderbolt, says Apple has a full year's head start". AppleInsider. Retrieved 25 February 2011. ^ Nilsson, LG (25 February 2011). "Intel announces Thunderbolt". VR-Zone. VR Media. Retrieved 27 February 2011. ^ "Light Peak: Overview" (PDF). Intel. Retrieved 29 June 2011. ^ "White Paper: The 50G Silicon Photonics Link" (PDF). Intel. Retrieved 29 June 2011. ^ "Thunderbolt trademark rights will be transferred from Apple to Intel". AppleInsider. 20 May 2011. Retrieved 16 June 2013. ^ "Sumitomo Electric Starts Selling Optical Thunderbolt Cable at Amazon Online". Global Sei. ^ a b c "Optical Cables by Corning launched as the first Thunderbolt™ all-optical fiber cables". Corning. 11 September 2013. Retrieved 22 September 2013. ^ Patel, Nilay (24 September 2009). "Video: Intel's Light Peak running an HD display while transferring files... on a hackintosh". Engadget. AOL. Retrieved 25 February 2011. ^ Ziller, Jason (26 January 2010). Intel Light Peak Interconnect Technology Update (YouTube). Intel. Event occurs at 1:20. Retrieved 23 February 2011. ^ "Light Peak to succeed USB 3.0". UK: The Register. 15 April 2010. ^ Shiels, Maggie (25 September 2009). "Future is TV-shaped, says Intel". BBC News. Retrieved 27 September 2009. ^ Collins, Barry (4 May 2010). "Intel shows off first Light Peak laptop". PC Pro. Dennis Publishing. Retrieved 5 May 2010. ^ Hollister, Sean (14 September 2010). "Intel's Light Peak optical interconnect shrinks slightly, LaCie, WD, Compal and Avid begin prototyping". Engadget. AOL. Retrieved 28 November 2010. ^ Hachman, Mark (24 February 2011). "Intel Thunderbolt Rollout Won't Be Lightning Fast". PC Mag. Ziff Davis. Retrieved 26 February 2011. ^ Shankland, Stephen (23 September 2009). "Intel's Light Peak: One PC cable to rule them all". CNet News. CBS Interactive. Retrieved 28 November 2010. ^ a b Crothers, Brooke (29 September 2009). "Sources: 'Light Peak' technology not Apple idea". CNet News. CNet. Retrieved 23 February 2011. ^ Branscombe, Mary (5 August 2010). "Intel Light Peak: a tech guide". ZDNet. Ziff Davis. Retrieved 22 October 2012. ^ Shah, Agam (8 January 2011). "Intel says Light Peak interconnect technology is ready". Computerworld. International Data. Retrieved 23 February 2011. ^ "IPtronics Develops Components for Light Peak Technology" (Press release). IPtronics. 1 October 2009. Retrieved 5 April 2011. ^ Clarke, Peter (1 October 2009). "IPtronics, Avago chip in to Intel's optical interconnect". EE Times. Retrieved 1 October 2009. ^ a b Metz, Cade (24 February 2011). "Intel: 'PC makers took the light out of Light Peak'". The Register. Situation Publishing. Retrieved 25 February 2011. ^ Ziller, Jason (23 January 2010). Light Peak to Connect Consumer Devices at Record Speed (YouTube). Intel. Event occurs at 1:13. Retrieved 23 February 2011. ^ "Sumitomo Electric Starts Selling Optical Thunderbolt Cable at Amazon Online" (press release). Global SEI. 2013. Retrieved 16 June 2013. ^ "Delock Cable Thunderbolt™ optical male/male 30 m black". DeLock. Retrieved 15 October 2013. ^ "PSA: For Thunderbolt 3 over distance; use *OPTICAL Thunderbolt 1/2 cables!*". Macrumors. 28 March 2018. Retrieved 28 January 2019. ^ Crothers, Brooke (19 February 2011). "New high-speed connection tech due from Apple". CNet News. CBS Interactive. Retrieved 25 February 2011. ^ Kim, Arnold (19 February 2011). "Apple to Introduce Light Peak (High Speed Connection Technology) Soon?". MacRumors. Retrieved 25 February 2011. ^ Smith, Mat (21 May 2012). "ASUS and MSI launch Thunderbolt motherboards, tie for first place". Engadget. ^ "Thunderbolt: Next-Generation high-speed I/O technology". Apple. 24 February 2011. Archived from the original on 26 February 2011. Retrieved 25 February 2011. ^ "Apple Announces New iMac With Next Generation Quad-Core Processors, Graphics & Thunderbolt I/O Technology". Apple. Retrieved 10 May 2011. ^ "iMac (Mid 2011): Target Display Mode does not accept video over a Mini DisplayPort cable". Apple. 14 July 2011. Retrieved 17 July 2011. ^ Shah, Agam (12 April 2011). "Intel to Open up Thunderbolt Development This Quarter". PC World. PCWorld Communications. Retrieved 13 April 2011. ^ Holland, Colin (12 April 2011). "LeCroy lines up armada for Thunderbolt testing". EE Times. UBM Electronics. Retrieved 18 April 2011. ^ "Registration required for developer information". Intel. Retrieved 22 August 2012. ^ "Video Creation Bolts Ahead – Intel's Thunderbolt™ 2 Doubles Bandwidth, Enabling 4K Video Transfer & Display". Intel. 4 June 2013. ^ "WWDC: Neuer Mac Pro mit Thunderbolt 2.0 und USB 3.0". Heise. 10 June 2013. ^ MacBook pro with retina display updated with latest processors, faster graphics, longer battery life (press release), Apple, 23 October 2012 . ^ Apple (2013) "Thunderbolt". Apple. Retrieved 4 Feb 2014. ^ "Video Creation Bolts Ahead – Intel's Thunderbolt™ 2 Doubles Bandwidth, Enabling 4K Video Transfer & Display". intel.com. Retrieved 1 January 2016. ^ Walton, Jarred (19 August 2013). "ASUS Introduces Z87-Deluxe/Quad: World’s First Thunderbolt 2 Certified Motherboard". AnandTech. Retrieved 28 December 2013. ^ Torres, Edwin (28 January 2013) . MacRumors. Retrieved 28 January 2014. ^ Byrne, Seamus (2 June 2015). "One port to rule them all: Thunderbolt 3 and USB Type-C join forces". CNET. Retrieved 12 March 2018. ^ "Thunderbolt 3 is twice as fast and uses reversible USB Type-C". engadget.com. ^ "Thunderbolt 3 embraces USB Type-C connector, doubles bandwidth to 40Gbps". arstechnica.co.uk. ^ "Thunderbolt™ 3 – The USB-C That Does It All | Thunderbolt Technology Community". thunderbolttechnology.net. Retrieved 24 November 2015. ^ a b "Leaked Info on Third-Generation Thunderbolt Points to 40Gbps Transfer Speeds". MacRumors. 21 April 2014. Retrieved 19 November 2014. ^ a b "Next-gen Thunderbolt details: 40Gbps, PCIe 3.0, HDMI 2.0, and 100W power delivery for single-cable PCs". Extreme Tech. 22 April 2014. Retrieved 19 November 2014. ^ a b "Next-gen Thunderbolt doubles speeds but changes the connector". Ars Technica. 22 April 2014. Retrieved 19 November 2014. ^ "Thunderbolt 3 devices". Thunderbolt Technology. January 2016. Retrieved 9 January 2016. ^ "MacBook Pro - Technical Specifications". Apple. Retrieved 12 March 2018. ^ "iMac Pro - Technical Specifications". Apple Inc. Retrieved 12 March 2018. ^ Ziller, Jason. "New Intel® Thunderbolt™ 3 controllers offer DisplayPort 1.4, and basic peripheral compatibility with USB-C computer ports". Thunderbolt Technology. Intel. Retrieved 15 January 2018. ^ "Intel has a grand plan to bring Thunderbolt 3 ports to every laptop". Techradar. Retrieved 24 May 2017. ^ Bright, Peter (4 March 2019). "Thunderbolt 3 becomes USB4, as Intel's interconnect goes royalty-free". Ars Technica. Retrieved 4 March 2019. ^ Lilly, Paul (30 July 2018). "Complex Threadripper hack gets Intel's Thunderbolt 3 working on AMD hardware". PC Gamer. Retrieved 20 February 2019. ^ "Gigabyte Unveils the Z170X-UD5 TH Thunderbolt 3 Certified Motherboard". Retrieved 30 September 2015. ^ "MSI embraces Skylake and Thunderbolt 3.0 for new gaming laptops". Retrieved 30 September 2015. ^ "New Alienware laptops pack Thunderbolt 3 and prettier screens, but oddly lack Skylake". Retrieved 30 September 2015. ^ a b Graham, Robert (24 February 2011). "Thunderbolt: Introducing a new way to hack Macs". Errata Security. Retrieved 5 March 2011. ^ a b c Sevinsky, Russ (1 August 2013). Funderbolt: Adventures in Thunderbolt DMA Attacks (PDF). Black Hat Briefings. Las Vegas. ^ "Thunderbolt how it works". Intel. 2014. Archived from the original on 29 October 2014. Retrieved 1 May 2018. ^ Sevinsky, Russ (1 October 2013). Black Hat USA 2013 - Funderbolt: Adventures in Thunderbolt DMA Attacks. Retrieved 16 July 2014. ^ Heasman, John (2007). "Hacking the Extensible Firmware Interface" (PDF). Black Hat. ^ Snare (2012). "Mac EFI rootkits" (PDF). Black Hat. ^ Hudson, Trammell (27 December 2014). "Thunderstrike: EFI firmware rootkits for MacBooks". Chaos Communication Congress. ^ US-CERT/NIST (30 January 2015). "CVE-2014-4498: The Thunderstrike issue". ^ "About the security content of OS X Yosemite v10.10.2 and Security Update 2015-001". Apple. 4 February 2015. ^ Foresman, Chris (30 June 2011). "The technology inside Apple's $50 Thunderbolt cable". Retrieved 2 July 2011. ^ van Beijnum, Iljitsch (20 June 2012). "Hands-on: Apple's Thunderbolt Gigabit Ethernet adapter". Ars Technica. ^ Gurman, Mark (10 January 2013). "Apple slashes price on Thunderbolt cable, releases additional shorter model". 9to5Mac. ^ Anthony, Sebastian (2 June 2015). "Thunderbolt 3 embraces USB Type-C connector, doubles bandwidth to 40Gbps". Ars Technica UK. Nilsson, LG. "Intel cans 3.4W TDP Cactus Ridge Thunderbolt chip". VR-Zone. Retrieved 30 March 2012. Nilsson, LG. "Thunderbolt roadmap unveiled, new features coming to Apple et al". VR-Zone. Retrieved 24 July 2012. Chen, Monica. "Intel to release new Thunderbolt chip in 2Q13". Digitimes. Retrieved 24 July 2012. Nilsson, LG. "Intel finally shipping 2nd gen Thunderbolt controllers, just in time for new Macs". VR-Zone. Retrieved 14 August 2012. Shimpi, Anand. "New Thunderbolt Controllers (DSL4510/4410) and Future 20 Gbps Falcon Ridge TB Controller Announced". AnandTech. Retrieved 8 April 2013. Verry, Tim. "IDF 2013: Products With 20Gbps Thunderbolt 2 Appear At IDF 2013". PC Perspective. Retrieved 14 October 2013. "New Intel® Thunderbolt™ 3 controllers offer DisplayPort 1.4, and basic peripheral compatibility with USB-C computer ports". ^ "Intel® JHL6540 Thunderbolt™ 3 Controller Product Specifications". intel.com. ^ "Next-Gen Intel "Alpine Ridge" Thunderbolt Controller Detailed". techpowerup.com. ^ "Alpine Ridge 頻寬可達 40Gb/s，新一代 Thunderbolt 晶片將具更多功能 - VR-Zone 中文版". vr-zone.com. 19 April 2014. ^ "Intel® JHL7340 Thunderbolt™ 3 Controller Product Specifications". intel.com. ^ "Intel® JHL7540 Thunderbolt™ 3 Controller Product Specifications". intel.com. ^ "Intel® JHL7440 Thunderbolt™ 3 Controller Product Specifications". intel.com. Wikimedia Commons has media related to Thunderbolt (interface). Thunderbolt 3 – The USB-C That Does It All.